Fairbanks–It’s over one-ton later and our supplies are ready for take-off from the Fairbanks International Airport. The three of us–including Dolores van der Kolk, a geology Ph.D. candidate from the University of Texas-Austin and her husband Peter Flaig, a doctor of geology at UT-Austin—handled the tonnage no less than three times in our preparations for the next month. 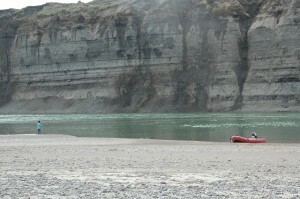 We will be taking up residence in tents along the Colville River on the North Slope of Alaska until Sept. 2. Our Grand Caravan is set to leave Sunday from Fairbanks, laden with two boats, motors, fuel, food, computers, sample bags, cameras and of course, tents for housing. This area along the Colville River near Umiat—about 140 miles southwest of Deadhorse—is known as a goldmine for dinosaur fossils and has been drawing geologists there regularly since the late 1980s. “Dino digger” headlines are commonplace in the media that follow these things. It’s also known for the Umiat oil field, which some say holds more than 1 billion barrels of oil. She’ll be looking at fossils from former sea creatures and land creatures to figure out that transition is my rough explanation of that lengthy title. I will know more as the trip goes on, not being a geologist. I do know from past experience that shells from the former seabed are laying all over the surface of the bluffs along the Colville. 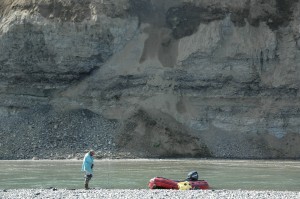 My job will be to handle the gear on the river and transport rocks from up and down the bluffs. My work this time will not be done with a pen, but a Maddox pick. I’ll be carefully scraping earth away so van der Kolk can get a good look at it and tell us what’s there. We will then get to haul buckets of the stuff down to camp to ultimately be flown out to Texas for further review. It shouldn’t be easy work. It’ll be windy, likely in the 50s during the day and getting colder the closer the calendar gets to September. It should rain and snow and in the morning we will be greeted by fog coming in from the Arctic Ocean. We will work no matter, given the expense, logistics and limited time allowed to work on the bluffs on this trip. The bluffs are protected because of, among other creatures, peregrine falcon nests. The land is the part of the National Petroleum Reserve. And while we will be dancing amidst the romance of knowing that dinosaurs roamed the region, our permits prevent us from hauling out the next Pachyrhinosaurus (discovered there in 2006). There will be paleontologists about 10 miles away from us, the nearest humans. But we should see signs of Pachy and his friends here from 70 million years ago. Steve Hasiotis, an ichnologist from Kansas, who studies trace fossils’ tracks, trails and burrows found in the rocks left by marine and land animals will be joining us Aug. 23. 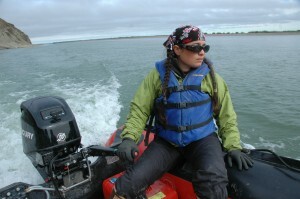 He’ll be flying onto our sandbar with Annie Miller, a hydro geologist grad student from UT-Austin. She’ll be taking core samples while I boat her around. To get us and our stuff to Umiat, we’ll be flying a Cessna Grand Caravan for a few hours, crossing the majestic expanse of the Brooks Range. From there we will be taking a helicopter to our sandbar, which will be home for two weeks. Then we will move north, ending our trip flying out of Nuiqsut, an Inupiat community of about 400 on the Colville where there’s an airstrip. If the planets align with the technology I should be able to send stories to the Baltimore Post-Examiner crowd via satellite phone as our trip proceeds.